Yes/No Control allows capturing a boolean value on your form. Allow the end-user to select yes / no value on the form. Allow the workflow designer to change the label for yes or no value. 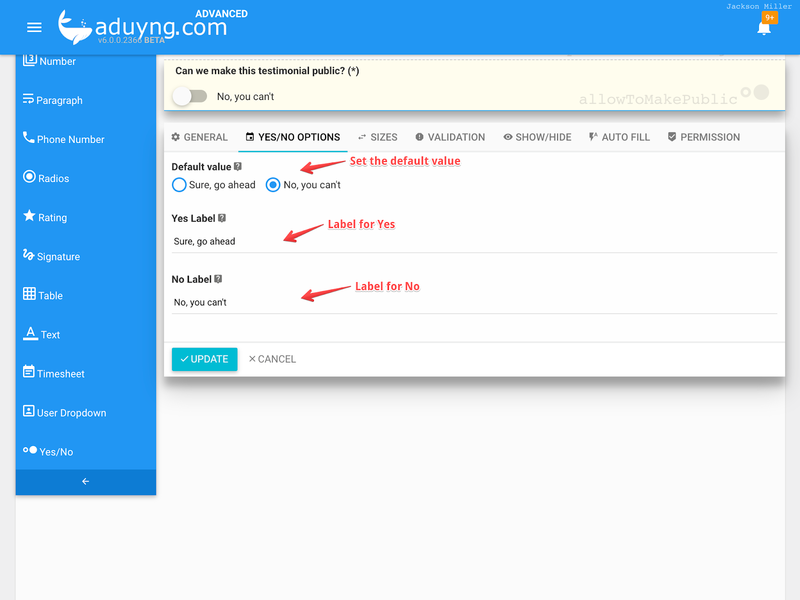 To add the Yes/No control to your form, simply drag and drop it from the control panel to the form-design area. To adjust the properties, click on OPTIONS tab on the properties panel below the control. Change the label for yes and no value. The animation below demonstrates how the end-user interacts with a Yes/No control. To filter documents using the rating field, click on FILTERS and select the field from the list of filters. Once the field is added, we can then click on this field using which we can specify a condition for filtering documents.